Step 1 Preheat oven to 350 degrees F.
Step 2 Cook the pasta to al dante according to package instructions. Be sure to add salt and olive oil to the boiling water. Drain and transfer pasta to 9 1/2″ x 13″ baking pan like this one. While still hot, drizzle pasta with a little more extra virgin olive oil and sprinkle grated Parmesan. Toss to combine. Set aside for now. Step 3 Make the meat sauce. In a large pan or skillet like this one, heat olive oil over medium-high heat until shimmering but not smoking. Saute onions until just golden, then add lean beef and garlic. Season with salt. Cook until meat is fully browned, tossing regularly and breaking up the meat with your wooden spoon (about 8 to 10 minutes). Carefully drain any excess liquid and return pan to heat. Add wine, crushed tomato, bay leaves, spices and pinch of sugar. Mix to combine. Bring to a boil for 5 minutes, then lower heat and let simmer for 10 to 15 minutes or so. Taste and adjust salt to your liking. Step 4 While the meat sauce is cooking, prepare the bechamel. In a large saucepan, heat olive oil over medium-high heat until shimmering but not smoking. Stir in flour, salt and pepper. Cook until golden (if needed, added a little more olive oil). Gradually add the warmed milk, whisking continuously. Continue cooking, stirring occasionally, over medium heat for 5 to 7 minutes, until smooth and thick. Add nutmeg. Step 5 In a small bowl, whisk a small amount of the hot bechamel mixture with the 2 eggs in a small bowl. Then return all to the pan with the remaining bechamel mixture. Continue to stir or whisk the mixture bringing to a gentle boil for just 2 more minutes. Taste and adjust salt and pepper. Remove from heat and allow to cool and thicken a little more (you should have a creamy, thick and smooth bechamel sauce). Step 6 Assemble the pastitsio. Top the cooked pasta with the meat sauce; smooth with a wooden spoon to fully cover the pasta. Now top the meat sauce with the bechamel topping. Again, smooth with your wooden spoon to cover the meat sauce evenly. Step 7 Bake the pastitsio in 350 degrees F heated-oven for 1 hour until golden brown. Remove from heat and set aside for 10 minutes before serving. Cut into square pieces and serve. 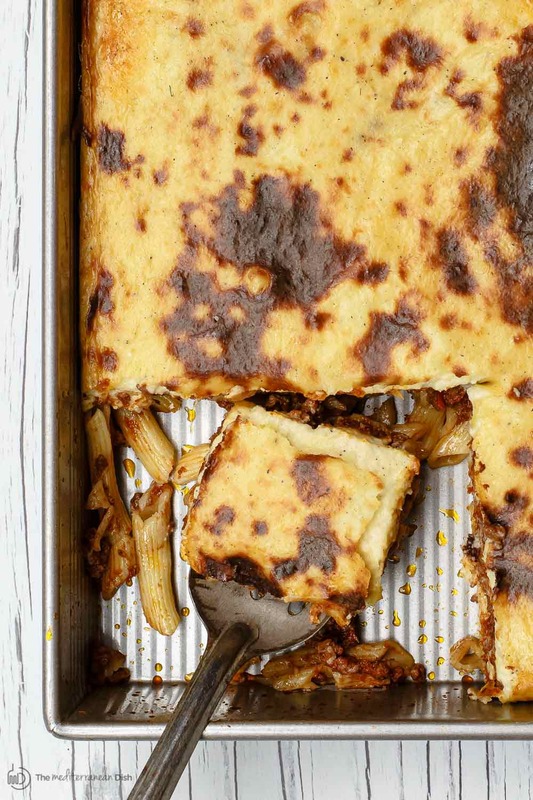 BEST Greek pastitsio recipe. Delectable and flavor-packed baked pasta with Greek-spiced meat sauce and a “lightened up” golden bechamel topping. A must-try!